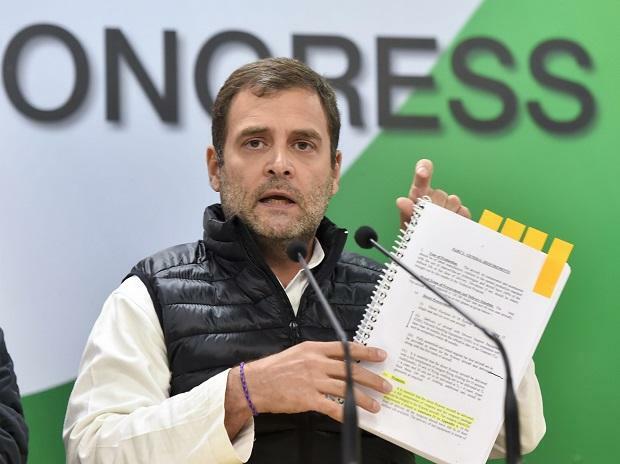 Congress president Rahul Gandhi on Saturday alleged that Defence Minister Nirmala Sitharaman"lied" in Parliament that government orders worth Rs one lakh crore were provided to HAL, while demanding that she should either place the documents in support of her statement in the House or resign. Gandhi's attack came after a media report claimed that "not a single rupee of the said Rs 1 lakh crore has come to HAL, since not a single order, as claimed, has been signed till now". The media report cited senior HAL management officials in order to back its claim. The Congress has been targeting the government, alleging that it denied the Hindustan Aeronautics Limited (HAL) an offset contract under the Rafale fighter jets deal with France, a charge the government has denied. The Bharatiya Janata Party-led National Democratic Alliance (NDA) government has accused the Congress of not supporting HAL during its rule and asserted that the government is now strengthening the defence public sector undertaking. "When you tell one lie, you need to keep spinning out more lies, to cover up the first one. In her eagerness to defend the PM's Rafale lie, the RM lied to Parliament," Gandhi tweeted. "Tomorrow, RM must place before Parliament documents showing 1 Lakh crore of Govt orders to HAL. Or resign," he said. Gandhi had on Saturday accused Prime Minister Narendra Modi of "weakening" HAL to help his "suit-boot" friend. Gandhi's attack on Saturday had come over a media report which claimed that HAL, grappling with low finances, was forced to borrow Rs 1,000 crore to pay salaries to its employees for the first time in years. Congress's chief spokesperson Randeep Surjewala tweeted on Sunday: "The Lying Defence Minister's Lies Get Exposed! Defence Minister claimed that procurement orders worth Rs 1 Lakh Crore provided to HAL! HAL says Not a SINGLE PAISA has come, as Not a SINGLE ORDER has been signed!" "For the first time, HAL forced to take a loan of ?1000 Cr to pay salaries!," he added.